In my book on the subject, Chapter 2 introduces you to England's Henry VIII, the king from 1509 to 1547. He was the granddaddy of personal branding if ever there was one, and the perfect model for generating and expressing a memorable persona. Most people are familiar with the famous Holbein portrait of him standing tall, broad-shouldered, filling up the canvas in his regal robes and codpiece. An icon of strength and robust health, this king gave the people what they wanted: physical power, great wealth, cultural sophistication, grand architecture, athletic supremacy, and a direct link to God. What you see was not always what you got with King Henry, but he lived in an age without mass communication or the immediacy of social media, so he could get away with projecting an inflated persona that suited everyone's needs. In today's world, authenticity rules, and you must build a brand persona you can live by. So what is a brand persona? It is a compilation of values, activities and interests that define a person. If you are an author, artist or business person, your work defines you to a great extent, but also the realm in which you work or the subject matter on which you focus. Add to that your activities. For instance, are you a runner? An equestrian? A motocross enthusiast? Do you love to cook, read, dance? And then there are societal interests like improving literacy, reducing poverty, protecting the environment, and so on. What do you stay up late thinking about? Where would you invest your money to make a difference in the world? Where/how would you donate your time? What are you doing when you are at your best? Your brand persona might not include all facets of your life and interests. Consider the top 10 that might come up in a conversation with a new acquaintance. You might only have 30 seconds with this person before you shake hands and say goodbye. If he or she is a potential customer, what would you hope might be remembered about you? That's how a defined persona can help, by clarifying the kernel of you and making it easier to communicate and, therefore, easier to remember. And now we come to the logical next step. Suppose this person is a fine business prospect, but knows 10 other people who do what you do? How can you not only rise to the top in this person's memory, but also rise with distinction? Remember that a personal brand is all about building trust with your audience. Your persona embodies all of your values, interests and drives that make you someone worth trusting and doing business with. Your positioning statement zeroes in on the places your persona intersects with audience values and needs, and then shoots it to the next level by defining that which connects with and makes you irresistible to them -– capturing the essence of you that is different from (re: better than) anyone else. Positioning statements are used broadly in brand differentiation. The secret is, you've got to get emotional. People make decisions on an emotional level. If you know your own core brand driver, it's the best place to start. For [insert target audience], [Your Name] is the [insert point of differentiation] among all [insert frame of reference] because [reason to believe]. Here's a silly example: "For people who need dog walkers, Jane Dogmire is the most lovable and trusted of all dog walkers in the region because she is board-certified by Dogs United and comes with homemade peanut butter treats." Jane meets the needs of her audience because she can be trusted to do the job right, and will keep her dogs happy, too. For readers of historical fiction, Nancy Blanton is the award-winning author of Irish history adventure novels, combining research skills with a passion for Irish heritage to both inform and entertain. Note how my values and audience values converge. Words like adventure and passion help tap into the reader's emotions. Normally, this statement would never be public, but would be used to guide me in creating advertising, marketing collateral, and online communications, and I could use the same words, or different words that do the same work. Once you've invested the time to build your persona and create your positioning statement, most of the heavy lifting for your personal brand is done. These are the guiding forces for the decisions you'll make going forward with taglines, marks, colors, and so forth. The big thing to remember is consistency. I know that every time I go to a Starbucks and order a mocha, with few exceptions I will get exactly what I expect and, therefore, I trust Starbucks. Stay true to the elements of your persona and positioning statement. Use the same words over and over. If your persona identifies your interests as horseback riding and cooking, don't confuse your audience by blogging or tweeting about golf and scuba diving. Be authentic, be consistent, and you will, over time, build trust. Trust brings customers. My book will guide you through all eight steps toward your own personal brand. For additional help, I can offer professional services. Please sign up for my newsletter for events and new publication notices. 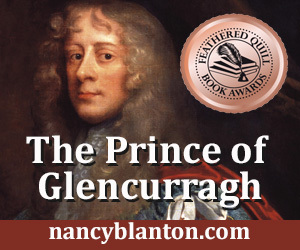 My latest novel, The Prince of Glencurragh, is set to publish in July 2016. Oh, and...I really like dogs. "Doherty was a big, bluff man with an aggressive, ambitious personality. What he lacked in finesse and polish, he made up for with confidence and determination." On the night of April 14, 1865 Doherty was called to action, to lead his men in pursuit of Booth and his accomplice who had fled Ford's Theatre after firing Lincoln's fatal shot and had crossed the Potomac River into Virginia. Doherty's men located and surrounded Booth in a barn where he was hiding, but Booth refused to surrender. They set fire to the barn and when the firelight revealed Booth's location inside, Sergeant Boston Corbett shot him through a crack in the barn wall -- intending to wound him in the arm, but Booth moved suddenly as the shot was fired and the bullet hit him in the head. Booth lingered for hours, similarly to Lincoln, but died at the Virginia farmhouse and later was buried under the floor of a Washington, D.C. prison. Doherty died two years later at age 59 and was buried in Arlington National Cemetery. My initial post about Lincoln focused not on his assassination, but on his persona, the cornerstone of the personal brand that helped him win the presidential election. "Like social media the telegraph is an electronic form of communication. The telegraph increased the speed at which information and communication could be received. It changed the world, it changed war, and it changed daily life." Lincoln certainly had his detractors. It would be impossible not to, leading a nation in the time of a civil war. Booth and his band had called him a tyrant. But Lincoln rose to power through his intellectual leadership, and in many cases was able to diffuse contentious situations through his powerful oratory. He was able to define, in elegant and often poetic layman's terms, the sides and meanings of an issue. Today we might call that "content marketing." And though some thought his physical appearance awkward, he did try to look the elegant part. "At his second inauguration, Abraham Lincoln wore a coat specially crafted for him by Brooks Brothers. Hand-stitched into the coat's lining was a design featuring an eagle and the inscription, 'One Country, One Destiny.' He was wearing the coat and a Brooks Brothers suit when he was assassinated." The story about Lincoln's personal brand is featured in my book, Brand Yourself Royally in 8 Simple Steps, available at amazon and B&N. To learn more about Doherty, see the story here. Please visit nancyblanton.com for more information about my books and to sign up for newsletter updates. My dear friend in southwest Ireland, Eddie MacEoin, sent me a picture of the town in Tipperary, Ireland that has the same name as my first novel: Sharavogue. I had hoped to visit there last summer but ran out of time. In Ireland there is never enough time. I didn't name the book after the town, but had stumbled across the name during my research. Its meaning--bitter place or bitter land--captured my imagination, because my book features an Irish girl indentured on a sugar plantation on the island of Montserrat. What a sweet bit of irony to name the plantation Sharavogue? Well, writers are often the recipients of stinging reviews, whether warranted or not, and one of my reviewers took me to task claiming I had that meaning wrong. One of us is definitely wrong, but I have two good sources that agree, so, I'm just saying (snark...), and I find it a beautiful and mysterious-sounding name reminiscent of Scheherazade. The quote below is from a biography, The Red Earl, the Extraordinary Life of the Earl of Huntingdon, by Selina Hastings. "Sharavogue--the name means 'bitter land'--is situated halfway along the road between Roscrea and Parsonstown (now Birr)...The tiny hamlet of Sharavogue lies on the edge of the Bog of Allen, surrounded by pleasant, well-farmed country, gently undulating and characterised by meadows and small copses, by bushy hedgerows and fast-running streams." After such a description, I looked for something following to explain why the town was so named, but there was no answer. Maybe, as Eddie's picture suggests, it becomes a rather wet and dismal place in fall and winter. The Sharavogue in my story depicts a time in history when the Irish were even more popular as slave labor than the Africans. As reported by IrishCentral recently, from a blog in Scientific American, the Irish clan system was largely abolished after the Battle of Kinsale at the end of Queen Elizabeth's reign. The English seized Ulster and sent some 30,000 prisoners of war to be sold as slaves in the colonies of America and the West Indies. "In 1629 a large group of Irish men and women were sent to Guiana, and by 1632, Irish were the main slaves sold to Antigua and Montserrat in the West Indies. By 1637 a census showed that 69% of the total population of Montserrat were Irish slaves, which records show was a cause of concern to the English planters." The Irish slaves were actually cheaper and often received harsher punishments at the hands of planters, according to the article. The 17th century is rich with stories that had profound effects on the course of history, and yet is is overlooked by many readers and writers. Watch for my new blog series on the 17th century, coming soon! Why not embark on an adventure in Irish history? Sharavogue makes an excellent gift for yourself or someone you know who loves historical ficion. Find it at amazon.com, barnesandnoble.com, iBooks and other independent booksellers. These three elements are much easier to develop once you have completed the earlier sections that give a full understanding of your audience, your brand, its basis and driver, your vision and mission. Your positioning statement helps clarify exactly what your audience needs to know. These elements also call into play one of the basic rules of communication, and particularly electronic communication – the three second rule. You’ve heard of this rule in regard to candy dropped on the floor (is it still safe to eat?) and most likely in basketball (a lane violation), but it also applies to websites, advertising and any visual communication – like book covers. The rule is, you have three seconds to capture a person’s attention. Either it is visually compelling enough to get readers to stay, or they bounce off to something else: Click to another site, pick up another book, turn the page, goodbye. Many things are constantly competing for a person’s attention these days. If you can’t grab them fast you’ve lost them. That’s why good headlines and strong graphic design are critical to your brand. Many people think writing a tagline is easy, and there certainly have been some classic tags that resulted from a sudden bolt of brilliance. But most of the time a good tagline requires creative thought about all the brand elements, focused brainstorming, and trial and error. A great tag line is memorable, enlightens people about your business, and differentiates your company and product from competitors. Generally, a good tag line is a short, catchy phrase with an interesting and positive message delivered in 3-6 words. Taglines are used in three ways: To highlight your brand driver or unique selling proposition, to introduce and showcase your brand, or to capture your positioning against your competitors. For an author or personal brand, you are showcasing yourself and your values, so the third option may be the best choice, but I would not rule any of them out. Brainstorming should not be constrained. Start by looking at the websites of other authors or professionals you admire. What is your first impression? Do they use a tagline? How is it used? What words do they use to describe themselves? Think about those words, borrow the ones you like, and list others you can think of that describe what you do. Next, think about your audience and try to answer this question: Why should they be interested in you and what you do? Answer in as many ways as you can. Consider your particular strengths, your style or approach. And think about what makes you different from others who do what you do. For me, I thought about my work in historical fiction, my focus on Irish history because of my own passion for it, and my decision to write it in terms of an adventure, with less detail than most historical fiction authors use, and with a faster pace. And, I decided to write my tagline as a call to action. The result? It may not be the world’s best tagline, but it is appropriate for me and it does tend to snag people in when they read it at my book festival booths. Especially if they are Irish or traveling to Ireland. Do some brainstorming by yourself or with someone else who knows you well. When you have a few options you like, test them on some friends or readers via email, Facebook or in person. See which option resonates the most, and then make it work for you everywhere: Your website, business cards, postcards, posters, one-sheet and wherever else it makes sense for you. A mark is that single graphic that stands for you, and would represent you when you cannot actually be present. For an author, in most cases your mark would be your name, and you might choose a particular type face to use consistently. You might be tempted to choose some of the more graphic typefaces that suggest your genre, like Edwardian Script for historical fiction, or Thriller for thrillers or mysteries. Resist temptation! You will be far better served choosing something that is clean and professional looking. If you decide to write in different genres you will have something that is effective across the board. If you work with a graphic designer for your book covers (highly recommended), your designer can help you find a typeface that could work well on your covers and be repeated in all of your promotional materials. Once you’ve selected a typeface, stick with it even if you are bored and tempted to try something new. Your signature typeface becomes a core part of your visual brand. If you will be self publishing, you may need an identity – a logo – that can be used for your book imprint. Again, the designer who does your covers can help ensure everything for your brand works together and can be used consistently. If you design your own there are a few things to remember. Always keep your audience in mind. It is easy to get caught up in something you think looks cool, but you may be too close to the process. The graphic you like may not resonate or even make sense to your audience. As with the tagline, be open to feedback. A logo should be simple, clean and strong enough to hold up equally as well whether you use it on the side of a city bus or the back of a ladybug. Don’t get too detailed with fine lines and shades that might not hold up. It’s a good idea to design first in black on white. Once that works you can think about colors. Print it in various sizes to see how well it reproduces. You may be sending it out to print media, and they are typically in a deadline rush in which your mark is not their priority. They can make a mess of even the best logos. A strong and simple mark will help you ensure consistency and protect your brand. You will need multiple file types (such as jpg, eps, tiff) and multiple sizes to send to the various places you’ll use this logo, so understand what they are and how each is used. Signature colors are a great way to express your brand. Brand colors should be chosen for specific reasons. Queen Elizabeth, for example, chose colors of white and gold to represent her purity, and red and black to express her wealth (red and black dyes were very expensive in her time). Courtiers who wanted to identify with her went to great expense to wear the same colors. In my last job, my organization operated an airport, a seaport, public marinas and public parks. So, the brand colors selected were light blue (air), green (land) and dark blue (sea) and were displayed in three wave-shaped bars indicating forward movement. For myself I chose two shades of green, to reflect both the color most often associated with Irish, and the prominent color on the cover of my first novel. I added a third color of ocean blue for variety and balance. I wear the greens at every book festival, signing or speaking event, not as a uniform but via a scarf or a nice silk blouse so the message is not shouted but still effective. And, I use the colors prominently in my book displays. What colors should you choose? Here again I strongly advise working with a graphic designer who has experience with various media and how colors behave in each. Print colors do not look the same as screen colors, but designers can find the best options to give you greatest consistency across all media. Think about the values you want to represent, and then take a look at a color chart to get some ideas. Color alone cannot be counted on to influence your readers’ behavior, because people tend to react to colors based on their own experiences, but it can play a role when it reflects the core values of your brand. I hope this series has helped you fill out your branding worksheet, or at least get a good start on it. I know it takes a bit of soul searching, but knowing your own brand sets you on a solid path for marketing yourself in a consistent and professional way. Let me know how it works for you. I’m happy to answer questions and respond to your comments. Happy branding! Sharavogue is an award-winning novel of 17th century Ireland and the West Indies. It is both historical fiction and fast-paced adventure. You can purchase Sharavogue at amazon.com, barnesandnoble.com, and most online booksellers. Visit my website at www.sharavogue.com for more information. Follow this blog for research updates and announcements. I’ll be posting a new series soon about my on-the-ground research in Ireland for my upcoming book, a prequel to Sharavogue. As a follow-up to my series on author branding (A Royal Undertaking), this post focuses on applying the lessons learned from the first personal branders – kings and queens throughout history. These were the people who first learned and demonstrated the power of a strong and consistent personal brand. Kings and queens needed their people to obey them, to respect them, and of course to pay taxes without storming the castle. Their personal brands could be communicated to all the places they could not go physically, to generate the acceptance they required to lead. So what can authors, and truly anyone who needs a personal brand, really use from the royalty discussed in my series? First and foremost, remember that we are all the kings and queens of our own brand. BE A TYRANT. I remember hearing a story about Paul McCartney’s road crew complaining that he was difficult to work for because of his controlling and demanding management style. McCartney’s response? Hey, it’s my name on the marquee at every show, not yours. Definition. Values are the basis of your brand and guide what you will and won’t do in your business and in your life. Values are what you want people to know about you, and get to the core of who you are. Hatshepsut’s primary values were leadership and legacy. Remember, in personal branding, you are promoting yourself, not your book. Readers want to engage with authors who are real people. Opportunity. You can’t be all things to all people. Find a niche that will allow you to shine, and has subject areas that speak to you and can keep you interested. Branding is a long-term relationship. As pharaoh, Hatshepsut had the opportunity to build things, so she focused on art and architecture to create her legacy. Focus. Hatshepsut focused specifically on a few main things that addressed her values. Don’t participate in every book event or every charity, choose one or two that fit your brand values and dig in. Many authors support literacy, for example, because what would we be without readers? And don’t run yourself ragged trying to be on every social media platform. Choose the ones that really serve you and fit who you are. Endurance. A strong consistent brand can endure. Note that Hatshepsut’s has been around for nearly 3,500 years. Make sure your brand is authentic and something you can always support and protect. Henry VIII: The key to King Henry’s personal brand is his persona. The powerful, charming, larger-than-life, man’s man image he created was something the citizens of his time already wanted, expected and respected in their king. He didn’t create something he wasn’t, but he did project and highlight those features that would please his audience. The virile king in shining armor beating his opponents in a jousting tournament, for example. Authors, like royalty, can create a persona in the minds of their audiences and the general public, to thereby be remembered. What aspects of your personality define you? What interesting facts about your personal or professional background make you stand out, and are those aspects important to readers of your genre? Queen Elizabeth I took the next step by positioning herself in the minds of her audience. This was important because of the turmoil of her times, to distinguish herself from her sister – Bloody Mary – who ruled before her, and from her mother Anne Boleyn who had been executed for treason. Elizabeth distanced herself from these negative images by claiming her descendancy from the Trojans, King Arthur and Henry VIII, her divine right to rule, emphasizing her values of peace, religious unity, international trade and naval dominance, and her purpose to maintain the well-being, security and prosperity of her people. Your positioning statement should establish you firmly in the minds of your audience. The colors, imagery and messaging you use should support your positioning and persona, be thoughtful and consistent, and repeated again and again. Your persona must support your positioning statement and vice versa. Louis XIV was the first royal I know of who, having defined values over fashion to drive his brand, insisted on written guidelines to maintain the brand’s consistency and therefore its power. A good written strategy helps ensure the brand is made visible and relevant to its target audiences. Lessons learned from Napoleon are more cautionary. To support a personal brand you must align your actions with your persona, and lean toward transparency rather than duplicity. When what you exhibit or say differs from what you actually do, you break down the trust that is essential to any brand. In today’s world of social media, we are all just an Instagram away from a trashed brand if we do not live our values. Napoleon also teaches us to listen to trusted advisors. Just as every writer needs an editor, every person needs to be open to other perspectives. Next week my post will walk you through the steps in a personal branding worksheet I first presented at the Amelia Island Book Festival in February. Sure, you could spend a year or two creating a personal brand. Or, with this worksheet and some soul searching, have your basic brand framed out in a matter of days. Embark on an adventure in Irish history with the novel Sharavogue, winner of the 2014 Royal Palm Literary Award. Now available from online booksellers. Author Nancy Blanton will be exhibiting at the South Carolina Book Festival in Columbia, SC, May 16-17, 2015. You may also connect with her on Facebook.